Enki is a multipurpose HTML template coming with many professional and well-designed homepage options which can cater many different website needs, including Architect, Business, Corporate, Creative, Freelancer, Museum, Shop, Restaurant and Magazine, along with a wide range of 49 other html pages. 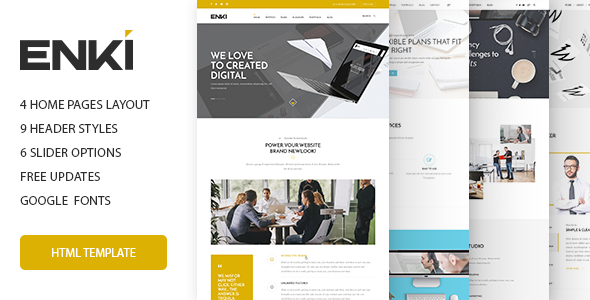 Enki is a fully responsive template built on popular Bootstrap 3 framework, ready to look awesome on any screen size, from desktops to mobile phones. The template is highly customizable and features beautiful shop pages which are best suited for implementing WooCommerce for your professional ecommerce project. Take a look at Enki then you will love it at the first sight.